We're back with yet another edition of our weekly article for Across The Pond Wrestling and doesn't a new wrestling weekend come round fast? Well this week we are heading Underground in Shrewsbury before a trip filled with Chaos in Bristol then ending up seeing some major Progress in London. Let's get Ready For The Weekend! 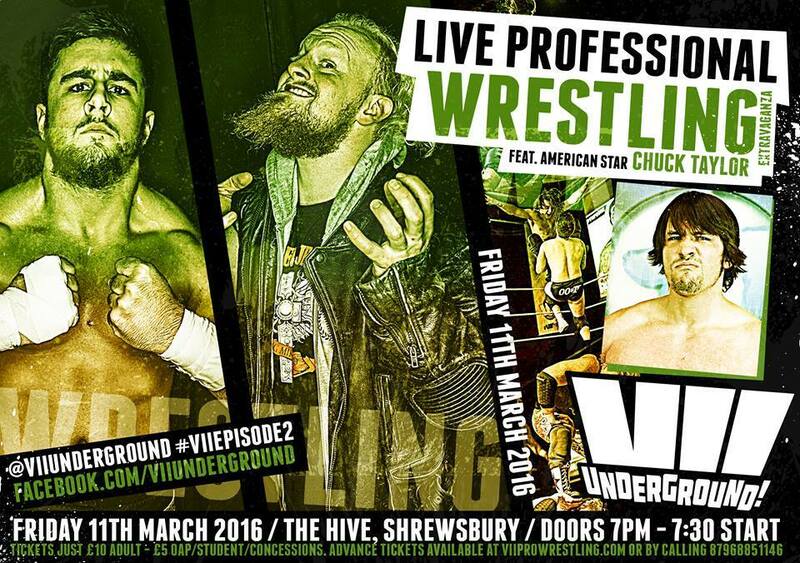 Friday night kicks off the wrestling weekend with VII Underground returning to The Hive in Shrewsbury with Episode 2: You And Whose Army?. 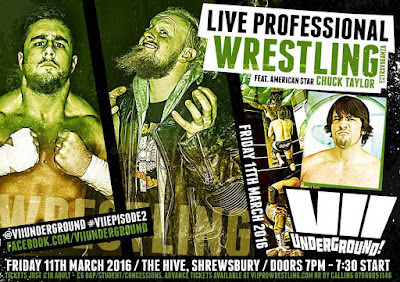 The first match that VII Underground announced should have been enough for fans to be reaching for tickets as Chris Ridgeway takes on Mike Bird. Ridgeway loves smashing people in the face, it's his thing and he does it exceptionally well. His opponent, Bird is also known for the beatings he delivers. He even holds a win over the current VII Pro Champion, Ryan Smile from July 2015. So let's see which one can hit the hardest and take the most punishment this Friday. Speaking of the VII Pro Champion, Ryan Smile, he'll be in six-man tag team action on March 11th when he joins forces with Ethan Silver and CHIKARA's Chuck Taylor to face The Bruiserweights' Pete Dunne, Dan Moloney and Wild Boar. The Bruiserweights and Smile have history together and it doesn't look like it'll be ending any time soon. Smile has now recruited one of the best wrestlers on the independent scene and a tag team specialist to aid him. This match could well be another chapter in the rivalry between these men. While Smile and The Bruiserweights have always been on opposite sides, Chris Brookes and Nixon Newell were once as close as family. The pair, who were once a part of The Vulture Squad, traveled all over Europe but alas those days as no more thanks to the recent attitude change in Brookes. While the attitude change has indeed been fruitful with Brookes now holding the British Lions Championship, he's turned against everyone who knew him. Nixon has now stepped in to try and put a halt to Chris Brookes' recent actions and maybe just get her tag team partner back. Moving on to Saturday and Hanham Community Centre in Bristol shall be the location for Pro Wrestling Chaos' latest sold out event, The Chaos Awakens. In recent months, "Flash" Morgan Webster has taken it upon himself to target any wrestler in the PWC ranks who wears a mask. Well, this Saturday he's going to face one of the best masked wrestlers in Europe in the shape of 'The Mexican Sensation' El Ligero. While Ligero is on course to face Mike Bird on April 9th, we're sure he won't mind taking a short detour to bring the fight to The Modfather of professional wrestling on March 12th. Many moons ago, Gideon and Ian Williams were the best of allies as part of The Doomsday Killers. Since Williams decided that Gideon was no longer needed, Gideon has declared war on The Doomsday Killers with the aim of getting Williams all to himself. Well now, after many months of taking out the other members, Gideon gets his hands on Williams and there will be nobody to stop him. 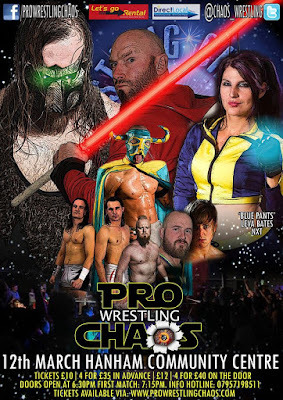 The main event of The Chaos Awakens' shall once again see Wild Boar defend the King Of Chaos Championship against Jeckel. After a controversial end to PWC's last show, owner, Pariah Khan has now made that match in an attempt to once again to relieve Boar of the championship and put it around the waist of his number one, Jeckel. Finally, the wrestling weekend shall once again head to The Garage in London where PROGRESS Wrestling ENDVR:15 takes place this Sunday. The main event for March 13th shall see the focus turned on the female division of PROGRESS as Jinny takes on SHIMMER's Leva "Blue Pants" Bates. 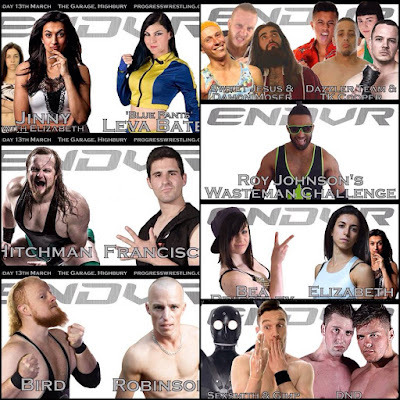 Leva's reputation proceeds her with a stand-out tour of the UK in recent weeks and killer matches to boot. She could well have another match that will have people talking after this weekend with an opponent in Jinny. 'The Knightsbridge Fashionista' is one of the fastest rising stars in the UK right now and has been in a lengthy battle with Pollyanna in PROGRESS for a number of months. While Leva is well known for her fun loving attitude, Jinny will know that behind that smile there is one hell of a competitor and a big fight coming her way this Sunday. Two men with an issue that needs to be settled are Mike Bird and Paul Robinson. After Robinson attacked Bird with a steel chair at ENDVR:14 in January, Bird has been looking for revenge against Robinson. While Robinson may not care what people think of him, he would be unwise to dismiss Mike Bird as it could well cost him a win. Six-man tag team action shall see the trio of Sweet Jesus and Damon Moser face Dazzler Team and TK Cooper. These six men have all had previous issues with opposing team members as Sweet Jesus have fought with Dazzler Team and Cooper has had issues with Moser. There are unresolved issues here so the best way to resolve those issues is to have them all fight it out this Sunday at The Garage. Who will come out on top is up for debate as is whether these teams will be able to get along for the duration of the match. Let's find out this Sunday. ‘Bodyguy’ Roy Johnson vs ?? ?